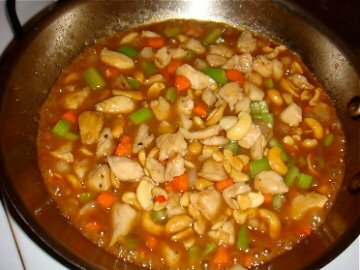 Maybe it’s not the smartest idea to try to make a traditional style Chicken with Cashews without doing much research. Or, maybe it is. Whatever I made, it didn’t quite match what you’d expect from the dish. Nonetheless, it was pretty damn good. 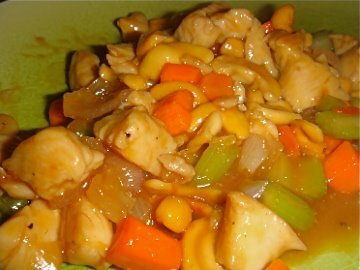 Marinate chicken in soy sauce for 15 minutes to an hour. Quickly brown chicken, say for about 2 minutes. Remove from pan. Add cashews and cook for about two minutes. Add the veggies and cook for another minute. Return chicken to pan, cook for…another minute! Add sauce, and cook till it thickens, about…a minute! Serve. Looking at the recipe, I think the hoisin, mirin, and rice wine vinegar would make it too sweet for me. Perhaps cutting the mirin and rice wine vinegar out the next time would yield better results.Thanks for adding us as a friend on Foodbuzz. We welcome you to come visit our site!